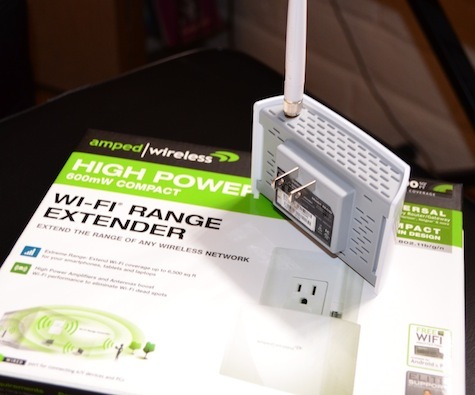 The Amped Wireless Rec 10 Wi-Fi range extender overcomes the problem of dead spots (and lost connections) within a 6,500 square foot area, or for a linear distance of 75 feet. Amped Wireless also sells more powerful Wi-Fi extenders that can cover up to 10,000 square feet, that are useful for small businesses or people living in modest sized castles. For the average person, use of the Rec 10 means your Wi-Fi signal can be extended to cover a large yard and patio area and a guest house if you have one, as long as all of them are within the 6,500 foot range. I tested the range by connecting my iPad to my router without the Rec 10 extender and walking out behind my house until I lost my Linksys Internet connection. I marked the ground at that spot, went into the Settings App on the iPad, and reconnected using the Rec 10 wireless extender. I tried this three times and it enabled me to stay connected 15–20 feet beyond the range of my Linksys. Walking in a different direction, I found the Rec 10 and my Linksys range to be just about equal. Putting aside the technical jargon concerning the hardware’s capabilities (see below), the question most of us want answered is: Does it work and how complicated is it to set up? Also, for those of us with Macs, is it compatible with Apple products? My tests showed the extender worked as advertised. Setup on my iPad was no more complicated than plugging the extender into a wall outlet, going to a website on my iPad, and following the onscreen instructions. I have a Linksys router and after setup the software adds a new wireless connection to my Wi-Fi preferences, which comes up as Linksys _RE. Select that name in the iPad’s wireless setup and you can now go sit at the far end of your pool and communicate with the world. The whole process takes about ten minutes. The Rec 10 is not designed to increase the speed of uploads and downloads, though at least one Internet posting claims it does. Using Speedtest.net, I saw no appreciable difference between download or upload times using the Rec 10; nor should there be since speed is determine by your Internet Service Provider (ISP), not the router. An argument can be made if the Rec 10 extends your Wi-Fi range and provides a signal where none previously existed, you’ve in effect increased the speed at that spot from zero. Admittedly, this is a bit of a stretch. The Rec 10 physical unit is an elegant, unobtrusive package, about four inches wide and not quite three inches high. The high gain antenna is about three and a half inches high and screws into the top of the unit. There are numerous other range extenders with similar capabilities, but Amped Wireless claims the standard products, as opposed to its high power extender, typically have 50mW amplifiers and less powerful antennas. By contrast, the Rec 10 amplifiers get 600mW of output power and use a high gain external antenna. The technical specs may have little meaning to the average consumer, but if you have a large house and are encountering dropped Wi-Fi connections, the Rec 10 may solve your problems. It also works if you have a smaller house with thick adobe walls (common in the Southwestern states) that are blocking your router’s signal.